Kyousougiga is a touching story about family, set in a fantasy world inside a painting. It has a beautiful setting and well-animated action. Unfortunately, it also gets far too convoluted for its own good. Kyousougiga has its roots in a Japanese fairytale. A lonely monk draws a rabbit which comes to life. Soon, the rabbit falls in love with the monk. But, as a rabbit, she feels she can’t properly love the monk. Luckily, a Bodhisattva takes pity on the rabbit and allows it to use her body. Thus, she comes to the priest in (mostly) human form and the two fall in love. Eventually, the two decide to have a child. And when that child seems lonely, the priest draws two more into existence. From that point on, they live as a family, eventually moving to a world the priest has drawn within a picture. But one day, the priest and the rabbit, fearing that the rabbit has stayed too long in the Bodhisattva’s body, leave their children alone in the world inside the picture. But what’s great about Kyousougiga is that this fairytale isn’t the story. It’s merely the backdrop—the set-up for everything else. The story succeeds by exploring the personal ramifications of the fairytale—showing what happens to the family when they are torn apart and all the long-reaching consequences that come up down the line. So while the setting of Kyousougiga is the story of the parents, Kyousougiga proper is the story of the three children: Myoe, Yase, and Kurama. With the disappearance of their parents, the three of them are trapped in the world of the painting and serve as its leaders. Over the years, they grow up into fundamentally flawed adults because of their shared parental abandonment. Myoe, the only human of the three children, becomes a slacker—nearly shunning the world and his role as one of its leaders. Yase, born from the picture of a demon, has built a life antithetical to her demon nature—making it one filled with ball gowns, tea parties, and everything else in the life of a proper lady. Kurama has done his best to be the perfect child—a wise, learned scholar who manages the city in a just, calm fashion. But below the surface, the scars are even more obvious. Myoe doesn’t feel that he is worthy of being the new priest and believes that, in the indeterminate future, his father will return and take the position back. Yase is more focused on their mother—hoping that by becoming a respectable high-class lady, her mother will be proud of her when she comes back to the world in the painting. Kurama dreams of being free from how he was created—able to cast off the responsibility and travel into the real world, unchained by the obligations forced upon him. And then there is Koto, a young teenage girl and the main character of Kyousougiga. She somehow gets into the picture world while searching for a black rabbit. Officially, she has no mother or father. She is an orphan raised by an agent of an organization tasked with protecting the multiverse. But while the children of the priest and rabbit had a family and lost it when they came to the world within the picture, Koto gains a family after she arrives—thus serving as a direct counterpoint to the Priest and Rabbit’s three children. I rarely comment on the art quality in an anime unless it’s particularly unique or abjectly awful. Thankfully, the art of Kyousougiga is a case of the former. The overall world portrayed almost creates a new visual style for fantasy all its own. The world appears to be both a modern and traditional ideal of the Japanese city of Kyoto. The people that populate the world range from beings that look human to others that look like nothing so much as cardboard cutouts or stick figures. Then, at the center of the city, towering on impossibly long wooden stilts, is the temple. And with Koto in the mix—with her almost visceral need to smash things with her giant hammer—we get some excellent, otherworldly fight scenes that cause more than a little collateral damage throughout the city. But outside of the world design, there is the excellent use of color. The lighting in the world is constantly changing from scene to scene and each location is filled with a vibrant look all its own. If nothing else, Kyousougiga definitely delivers on the eye candy. The biggest problem with Kyousougiga is not in the themes explored or the animation presented, it’s that the show is needlessly complicated. Of course, finding out about each character’s past and goals—and the history of the setting in general—is part of the fun of any anime. However, Kyousougiga goes too far in this regard, piling needless reveal upon needless reveal—overloading the audience with twists and revelations that in turn make previous twists and revelations moot. It honestly is so bad that, after the final episode, there is an extra episode where the voice actors summarize and explain exactly what happened over the course of the anime. Frankly, if you feel you need to spend thirty minutes to explain what happened in your anime, there is a fundamental flaw with the presentation that should have been addressed much earlier on. Random Thoughts – Just How Do I Watch This? 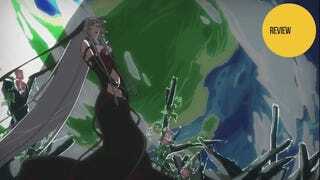 Originally, Kyousougiga was a 30-minute, single-episode original net animation (ONA). This was later followed up by five seven-to-twelve minute additional online episodes. Finally, as a prelude to the TV series, the first original net animation was edited and re-scored into an “episode 0” that ran before the start of the series proper. Going in, several Kotaku readers had told me that I didn’t need to watch the net animations as their content was integrated into the TV anime. However, I still opted to watch the episode zero, but I’m not certain if that’s what the average viewer should do. The problem is the entire episode is basically a spoiler of things to come as it shows (and resolves) the series’ midpoint climax. But on the other hand, while the same events are covered again midway through the series, they are done so in far less detail with much of the action and amazing art left on the cutting room floor. Personally, I wish I hadn’t watched the episode for all the spoilers it doled out; but the crazy and beautiful action scenes will no doubt hook many viewers far more soundly than the gradual character exploration you get if you start at episode one instead. Kyousougiga does a lot well. It has excellent character development and is a great thesis on the loss of one’s parents and how such a deep emotional wound can harm children all the way through adulthood. Moreover, it is just downright beautiful—a visual treat from start to finish. However, the convoluted nature of the plot with its countless reveals plagues the series greatly. But don’t get me wrong. If you like the idea of a stunningly drawn Japanese fantasy built around a broken family, Kyousougiga is very much worth a watch. It’s just unfortunate it falls short of greatness due to problematic writing in its final act. Kyousougiga aired on Tokyo MX in Japan. It can be watched for free and with English subtitles in the US on Crunchyroll. Oh and on a completely unrelated note, we’re nearing the halfway point of the anime season, so be sure to tell me which anime you think I should watch before I give out my recommendations over at our “best anime of the winter season" poll on TAY.